Where can we buy the coin stealer cat piggy bank? This adorable mechanical kitten comes out of cardboard box to steal your coins and help you collect money! The cat does not always pick up the money on the first try, but you will push the button and have the cat peek out. There are multiple kind of animals inside a box, but we really recommend the original of the cat. Which only costs $14! 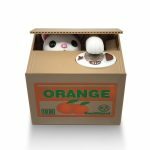 This entry was posted in Toys & Games and tagged cat steal, coin steal, coni box, orange box, piggy bank on April 9, 2017 by WhereCanWeBuy.